Missed the review for Volume 1? Find it here! Our story picks up with Kaguya, Miyuki and Chika at school just as Miyuki is showing off his brand new cell phone. Chika is excited and immediately asks for his contact info. Jealous, Kaguya tries to think of a way to get his contact info without seeming desperate. She cannot show any sign of actually wanting his info, because that would be leverage he could use against her. Miyuki, smug that he has the upperhand at the moment, waits patiently for Kaguya to ask for his info. After several awkward moments, he knows he must force Kaguya’s hand and make her more jealous by showing his adorable profile picture to Chika. As Chika fawns over his picture, Kaguya finally realizes how she can check-mate him. She begins to cry and call Miyuki cruel for not sharing his cute picture with her. Taken aback, Miyuki offers her the phone and Kaguya wins the first battle of the day. She gets to see Miyuki’s cute picture and memorize his contact info at the same time… the only catch… Kaguya’s cell phone is so out of date that she cannot use the same app as Miyuki. Womp-womp. The next chapters include amusing stories that center on a mysterious love letter, used as ammo in their love war. Kaguya attempting to share an accidental second-hand kiss by switching coffee mugs with Miyuki (in my personal favorite chapter Kaguya wants to put her lips on it). A confusing discussion of everyone’s first time, which ends with Kaguya completely misunderstanding what ‘first time means’ and announcing that she had ‘done it’ with her baby nephew. A strangely arousing cosplay with cat ears, and an encounter with a cockroach that ends with Kaguya being accidentally groped by a comatose Miyuki. Finally, Miyuki and Kaguya are asked to throw a welcoming party for a foreign exchange program visiting from their sister school in France. Kaguya suggests that two of the three of them go shopping for party supplies. Miyuki nearly offers to go with her before realizing this may be a trap. They end up in a stale mate, until Chika suggests a game of Forbidden Word. To win, you must not say the word your opponent has chosen for you. The catch is, only the two losers will get to go shopping together, so Miyuki must think of a way to not be the first to lose (to not seem desperate), but also not win, seeing as he really does desperately want to go shopping with Kaguya. For all his plotting and strategizing, Chika easily bests both of them by manipulating an emotional side they didn’t know they had. Shopping day has arrived! …. But the weather has not cooperated and a pouring rain storm has ruined their plans. Kaguya knows she must cancel their plans but tries to think of a way to still go, even with the storm. Heartbroken, Kaguya texts Miyuki to cancel their plans. Miyuki, so ready to go shopping to Miyuki has been standing outside in the rain, waiting for Kaguya. The day of the party has arrived! Kaguya, Miyuki and Chika are all exhausted from the intense planning they had to do to be ready in time. They still have one final task ahead of them though. Mingle. They must prove their linguistic prowess by communicating with the foreign exchange students in their native language. Miyuki comes prepared! He has studied a phrase book and memorized popular phrases. He tries to impress Kaguya by initiating a conversation with a student in front of her. But it seems his preparations have not been as affected as he’d hoped. They might as well be speaking in hieroglyphics. Kaguya swoops in and, in flawless French saves the conversation and blows Miyuki away. Miyuki realizes how unprepared he is and tries to plot an escape before he embarrasses himself any more. Just before he escapes, the principal of the school stops him and introduces him to the president of the French academy, Betsy Beltoise. A stunning beauty with a wicked mind. She attempts to show her dominance over Miyuki by absolutely slaughtering his entire person, slinging insult after insult, personal jab after personal jab. She begins to falter though, when Miyuki shows no emotion, no mental breakdown, no….nothing after her assault. This usually works!, she thinks. Before she can realize that Miyuki doesn’t actually understand French, Kaguya steps in and returns fire on the poor girl, reducing Betsy to a trembling mess. Both Kaguya and Miyuki have shown their strengths and weakness today. While this novel is not as hard hitting or side splitting as the first, it has some fantastic and memorable moments that make it a blast to read. Unlike some other stories where the back and forth tension between characters gets old or fizzles out, the fire between Kaguya and Miyuki keeps it spark. If you’re new to the series or have forgotten some of the first volume, this volume reintroduces the characters and setting in the first ten pages. You’ll feel all caught up or refreshed before diving in. The series itself was published, chapter by chapter, in a popular literary magazine in Japan. Which make the chapters feel like little self-contained stories or vignettes within the overarching plot. It actually acts as a plus in this case as it keeps the story refreshing and cuts out a lot bulk side-story that might detract from the intensity. The characters Kaguya, Miyuki, and Chika all have their shining moments that make them even more endearing. I worried Chika would become a bit more of a third wheel or ‘love-triangle’ bait but she keeps her oblivious chipper attitude that perfectly opposes the seriously intense Kaguya and Miyuki. We get to see more of their home life in this volume that really fleshes out the characters. Kaguya using her family’s staff as tools in her devious plans and also as a sounding board for all her problems shows a sweet, vulnerable chink in her armor. Miyuki having the embarrassing teen moment of his father answering the phone when a girl calls also shows his more vulnerable human side behind the stoic persona he uses in school. As always, I definitely recommend checking out this hilarious series. The clever innuendos and humorous, oblivious characters make this a quick, fun read. 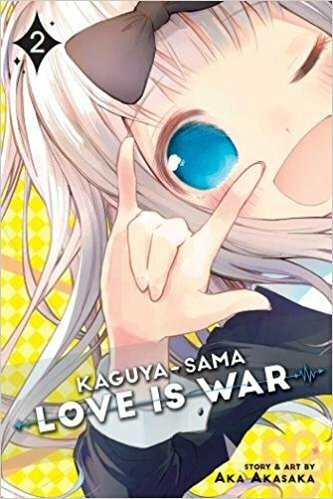 Want to read Love is War Volume 2? Find it here! VizMedia sent us a copy of Kaguya-sama Love is War vol. 2 in exchange for a fair review.